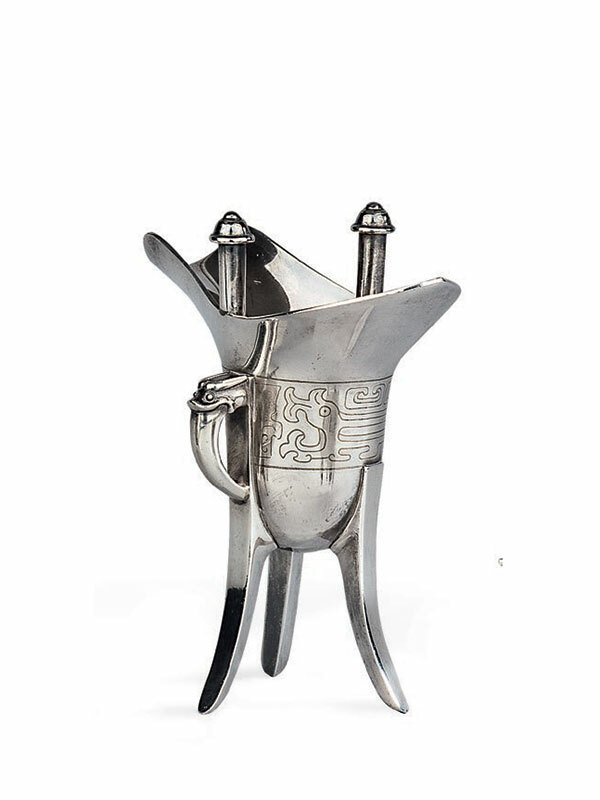 A miniature silver vessel of archaic bronze jue form, the deep U-shaped body supported on three slender, slightly splayed legs, which end in sharp points. The vessel has a long curved spout, and opposite it a pointed flange. Two circular posts capped by mushroom-shaped finials are raised from the middle of the mouth. A C-shaped handle with a dragon’s head is attached to one side. A single band of engraved decoration containing two stylised dragons encircles the body. The convex base of the vessel bears two marks: Chun Yin (‘pure silver’) and Mei (‘beautiful’).